An immaculately maintained, lovely home in the residential area of Cypress Lakes, Kissimmee, only 2 minutes from Osceola Parkway. The owner has completed extensive renovation work, which has included new flooring, furnishings and exterior landscaping. The subdivision of Cypress Lakes is one of the original areas for villa rentals in this part of Florida and was chosen for its location and access to the main theme parks. The 3-bedrooms and 2-bathrooms provide accommodation for 8 and the pool area is private and gives scope for al fresco dining around the pool. The owners have gone to great lengths to make this home cozy and welcoming and there is free international telephone calling from the house. 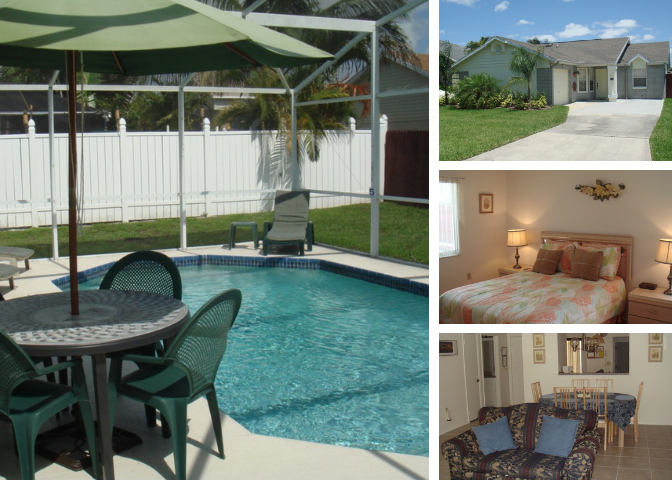 Situated in the primarily residential area of Cypress Lakes off Osceola Parkway in Kissimmee. This home is ideally located for easy and quick access to the airports, theme parks, restaurants and shops. Osceola Parkway is a direct road into the Walt Disney theme parks and also passes The Loop, one of Orlando’s fastest growing shopping centers. If you remain on the Parkway and join highway I-4 it will carry you to the Universal and SeaWorld parks in one direction or to the Gulf coast resorts around Clearwater in the other. For those flying into Orlando or Sanford International Airport, you merely exit and head for the toll highway SR 417 South and leave it at Landstar Boulevard.